Quality wines through sustainable practices. 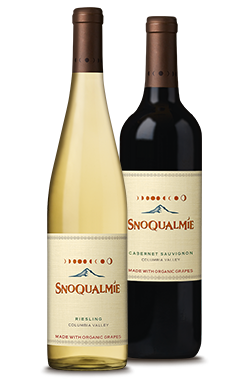 At Snoqualmie, we believe that extraordinary wines are the product of vineyard stewardship, sustainability, and a relationship with the local community. Our commitment to this philosophy has been the driving force behind our award-winning wines since 1983. More about our methodology. Our ECO wines are produced from certified organically grown grapes in a certified organic facility. True to the varietals, these wines fit perfectly with winemaker Joy Andersen's philosophy that it’s best to leave Mother Nature undisturbed. That patience is rewarded when the purity and true essence of the vineyard is reflected in every bottle. Grapes from the Columbia Valley have abundant natural fruit flavors which create distinctive wines with bright, bold tastes. Available nationally, these award-winning wines are approachable and food-friendly, meant to be enjoyed as part of any occasion, especially at the family dinner table.